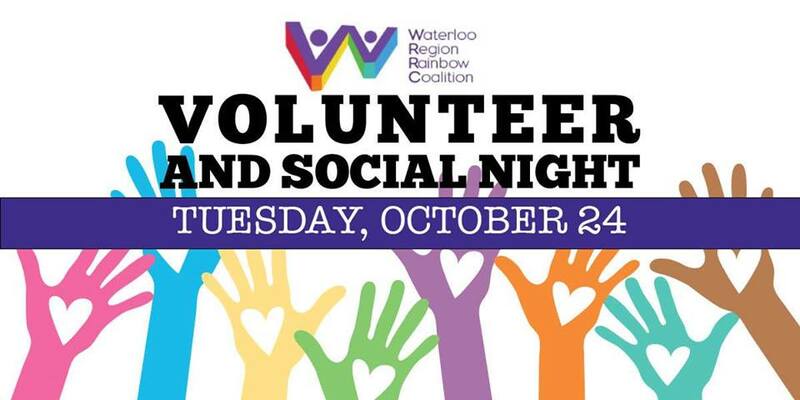 We are hosting a joint social and volunteer recruitment event with the Waterloo Region Rainbow Coalition on Tuesday, October 24th at 7:00 pm at Symposium Cafe in Waterloo. Come out to learn more about how to get involved with the Waterloo Region Rainbow Coalition and Queer Night Out. You can meet the board members and current volunteers, have the chance to ask questions and find the perfect role for you! There are currently opportunities to volunteer in areas such as: communications, fundraising. community engagement, Queer Night Out and more! If you can’t make it out in person you can also fill out a volunteer form here (http://yourwrrc.ca/get-involved/). You can also help spread the word about the event by sharing the Facebook Event link below or joining the Queer Night Out Waterloo Region MeetUp group.